Aaron Ramsey looks set to miss Arsenal’s festive fixtures after manager confirmed he picked up a hamstring injury in Champions League win against Galatasaray. 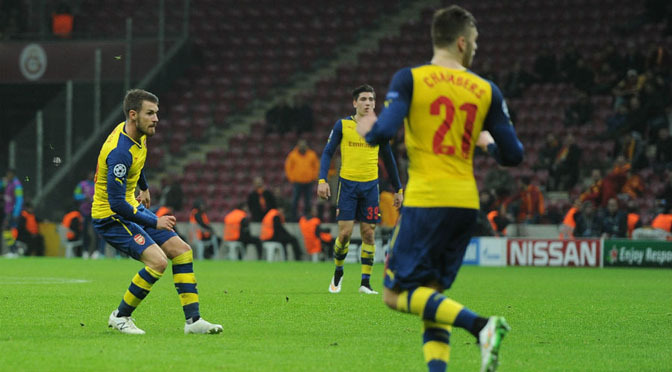 Ramsey’s stunning volley was a highlight of an impressive win in Turkey, but it seems that may be the last significant contribution he makes to Arsenal’s cause in 2014. Ramsey’s absence is one of many concerns for Wenger ahead of Saturday’s home game against Newcastle, with his defensive injury crisis reaching critical levels after he confirmed that Nacho Monreal and Laurent Koscielny are out, while Calum Chambers is also suspended. Wenger also said that his side’s poor display in the 3-2 defeat at Stoke last weekend was a blip in what he sees as an improving defensive record, despite the injury problems that have affected his squad this season. “Before Stoke, we got three clean sheets in a row, but always the last game that is judged for the quality of the team,” he said. “This is the modern game. Our last game was Galatasaray and we defended well there. I agree we didn’t defend well at Stoke. Arsenal produced the perfect response to silence their critics with a 4-1 Champions League win over Galatasaray in Istanbul, where Aaron Ramsey scored one of the goals of the season. Arsene Wenger had come in for abuse from the London club’s own supporters in the aftermath of Saturday’s disappointing 3-2 defeat at Stoke, which left them sixth in the Premier League. However, there was no European hangover as despite leaving several key players such as Alexis Sanchez back in London, the Gunners, who had already qualified for the knockout stages, romped to a comfortable victory, but still had to settle for runners-up spot in Group D behind Borussia Dortmund. Arsenal had raced into the lead after just two minutes when Lukas Podolski crashed the ball into the top left corner. Galatasaray defender Hakan Balta missed a great chance to equalise when he stabbed the ball wide from six yards. 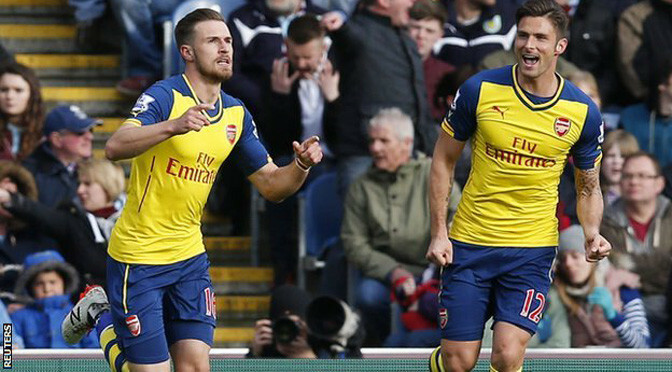 Ramsey made it 2-0 on 11 minutes with a neat finish after a quick break from Alex Oxlade-Chamberlain. Podolski lashed another fierce shot against the crossbar, before Ramsey netted a superb half-volley from all of 30 yards which was applauded by the home supporters. The second half was a much-more subdued affair, with Arsenal looking to counter after soaking up plenty of pressure with Per Mertesacker blocking a goal-bound shot from Umut Bulut on 65 minutes before Wesley Sneijder clipped home a late 20-yard free-kick. Podolski grabbed a fourth on the break deep into stoppage time. Arsenal will now regroup ahead of the knockout stages in mid-February, by which time Wenger could well have several of his injured stars fighting fit again to take on Europe’s best. Arsenal full-back Mathieu Debuchy returned following three months out, while Wenger named a bench with an average age of just over 18, handing an opportunity to fringe players such as Podolksi, Yaya Sanogo and Joel Campbell. It took German forward Podolski some 122 seconds to prove his point, as he lashed an angled drive the ball past Sinan Bolat from just inside the penalty area. Galatasaray, who sacked Cesare Prandelli following four successive Champions League defeats, looked to quickly respond, the fans who had bothered to turn out at the Turk Telekom Arena did their best to lift the home side. Hakan Balta dragged his shot wide from six yards after a corner was not properly cleared, and Arsenal then doubled their lead on 11 minutes. Tarik Camdal looked to have been tripped by a back-tracking Podolski, but Spanish refree David Borbalan waved play on. Alex Oxlade-Chamberlain was onto the loose ball in a flash, driving forwards to the edge of the Galatasaray area before slipping in Ramsey, who stroked in a low finish to the far corner. Podolski was inches away from cracking in a third when another fierce left-foot effort cannoned off the top of the crossbar after more good work from the busy Oxlade-Chamberlain. Arsenal continued to look dangerous on the break, with Ramsey, Sanogo and Campbell all failing to find a killer touch in the box, before Bolat turned a drive from Podolski behind. The Galatasaray keeper, however, could do little to prevent a third Arsenal goal on 29 minutes when Ramsey lashed the ball into the top right of the net after a corner was headed clear. With the match already over as a contest, to their credit the hosts looked to press again. Umut Bulut glanced a header wide, before at the other end Campbell skipped clear and his angled shot was touched across the face of goal by the keeper. Wenger decided to give the youngsters a taste of Champions League football for the second half. 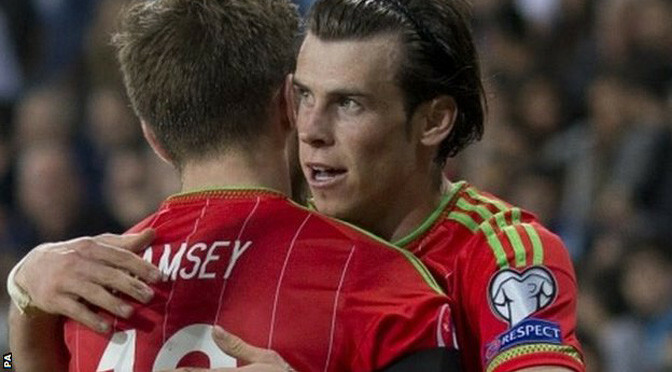 German 17-year-old Gedion Zelalem replaced Mathieu Flamini, and teenager Ainsley Maitland-Niles came on for Ramsey. The tempo of the match dropped, with Arsenal content to soak up plenty of pressure and look to counter. On 65 minutes, stand-in Arsenal captain Mertesacker – castigated by pundit Jamie Carragher for ‘abandoning ship’ in the defeat at Stoke – produced a brave block to throw his body in the way of Bulut’s close-range effort. Galatasaray had a consolation with two minutes left when Dutchman Sneijder whipped a free-kick up over the wall into the top-left corner, but there was still time for Podolski to slot in a fourth for Arsenal on the break with what was the last kick of the match. Arsenal, who blew a 3-0 lead at home to Anderlecht on matchday four, will now await their last 16 opponents in the draw – when the likes of Real Madrid, Barcelona, Paris St Germain and defending champions Bayern Munich could all yet come out of the top seed pot. 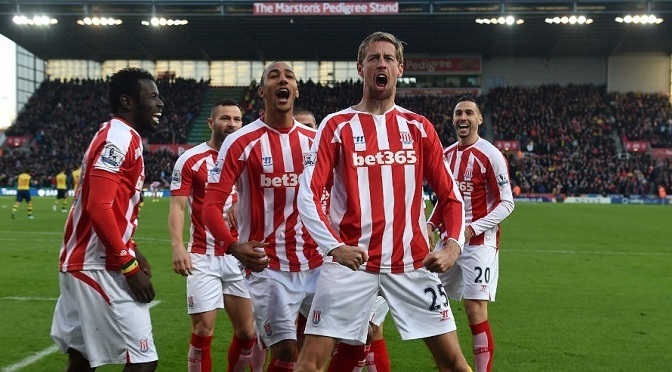 Stoke held on to beat Arsenal 3-2 after a dramatic afternoon at the Britannia Stadium. The Gunners are the team Stoke relish taking on more than any other and the home fans were in dreamland after Peter Crouch, with the fastest goal of the Premier League season, Bojan Krkic and Jonathan Walters put them three up at half-time. But, after Bojan had a fourth ruled out for offside, Santi Cazorla pulled one back from the penalty spot and two minutes later Aaron Ramsey reduced the deficit further. There were still 20 minutes to play but the sending off of Calum Chambers for two yellow cards reduced the heat a little and Arsenal could not find a third. The result brought an end to Arsenal’s run of three successive wins and ended a losing sequence of three for the hosts. The bad blood between these teams dates back to the challenge made by Ryan Shawcross on Ramsey nearly five years ago that broke the Arsenal player’s leg. Arsene Wenger was unhappy with pre-match comments from Shawcross hyping up the rivalry and the Stoke captain’s name was greeted with loud boos from the visiting fans. But they were silenced only 19 seconds into the match as Steven Nzonzi got away down the right and sent over a cross that Chambers failed to clear under pressure from Mame Biram Diouf. The ball ran to Crouch, making his first start in more than a month – and he had the simple task of tapping it in after goalkeeper Emiliano Martinez lost his balance and fell over. Teenage defender Hector Bellerin was making only his second Premier League start for Arsenal and his fine cross in the 11th minute should have set up an equaliser but somehow Olivier Giroud headed wide. Bojan has grown into Stoke’s main creative force and his link-up play, in particular with Crouch, was causing Arsenal real problems. Stoke were relishing the lively atmosphere and tempo and full-back Phil Bardsley got into the spirit with a fierce shot that Martinez could only push uncomfortably away. 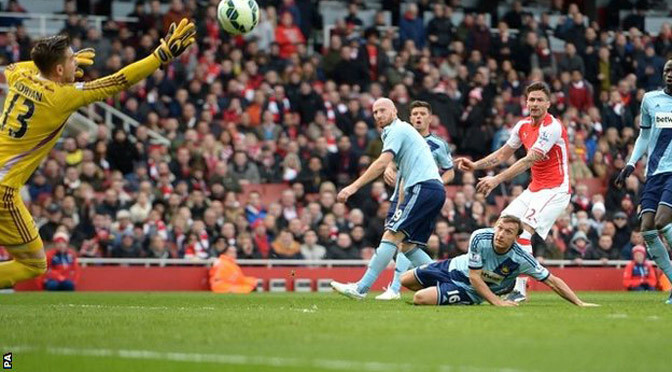 Fortunately for the Arsenal keeper, Chambers reacted quickly to ensure Crouch could not take advantage of the rebound. Arsenal looked sporadically dangerous and Asmir Begovic may well have been struggling had Cazorla’s 20-yard effort been on target rather than just over the bar. But largely the game was being controlled by Stoke and it was no more than they and Bojan deserved in the 35th minute when the Spaniard classily converted Walters’ terrific cross. The gleeful chant of ‘2-0 to the rugby team’ rung around the stadium – mocking a famous Wenger jibe about Stoke’s style of play under former manager Tony Pulis. But even the Arsenal boss must have been impressed by the fluidity of Stoke, who were simply outplaying his side. Begovic had to be alert to preserve the lead in the 38th minute when a Giroud header deflected off Shawcross, but just before half-time Stoke added a third. Bojan’s corner was headed down by Crouch and an unmarked Walters slammed the 100th club goal of his career high into the net. Unsurprisingly, Wenger shuffled things around for the second half, sending on Danny Welbeck for Bellerin, with Mathieu Flamini moving to right-back. Welbeck was straight into the action, seeing a shot deflected wide, but Stoke continued to pose plenty of problems. Martinez was having an uncomfortable afternoon and he was caught out by a Bojan free-kick in the 51st minute. The keeper had to dive back towards his goal to keep it out and was fortunate the ball arrived at Geoff Cameron’s feet too quickly for the defender to do anything with it. At the other end, Alexis Sanchez almost made Nzonzi pay for a poor error when he ran through on goal, beating Shawcross and Begovic, but shot against the post. It looked curtains for Arsenal when Bojan found the net for the second time in the 65th minute – but a belated offside flag cut short the celebrations. The Gunners went down the other end and won a penalty when Diouf tripped Flamini. Begovic got a hand to Cazorla’s shot but could not keep it out – and two minutes later Ramsey reduced the deficit to a single goal. Begovic produced a fine save from Welbeck but Sanchez’s corner picked out Ramsey at the back post and he shot through a crowd of players. Arsenal pushed hard for an equaliser but found themselves reduced to 10 men 12 minutes from time when Chambers was shown a second yellow card for pulling Bojan. And, despite putting Stoke under a lot of pressure, the third did not come. Arsenal sent out a statement of intent for the season as they impressively dismissed Manchester City in the Community Shield at Wembley. The FA Cup winners took the lead through Santi Cazorla’s angled shot and added to that when Aaron Ramsey drove in a strike to finish a counter-attack. Premier League champions City came close when Stevan Jovetic had a header hit the post and a shot saved. But Olivier Giroud’s dipping 25-yard strike secured Arsenal’s win. The victory is the first for Arsene Wenger’s side in the English season’s curtain raiser since 2004, and should give them plenty of belief before they start their top-flight campaign against Crystal Palace on Saturday. The Gunners fielded three of their four summer signings as forwardAlexis Sanchez, right-back Mathieu Debuchy and defender Calum Chambers started, with the trio appearing to have effortlessly slipped into Arsenal’s trademark one-touch free-flowing football. City were missing eight key players and, while manager Manuel Pellegrini may play down the defeat, it will serve as a warning sign before they begin the defence of their top-flight title at Newcastle on Sunday. Pellegrini had insisted he had a stronger squad at his disposal this season as he gave two of his five summer signings in midfielderFernando and keeper Willy Caballero starts. However, he was not helped by the absence of Vincent Kompany, Pablo Zabaleta, Fernandinho, Sergio Aguero, Martin Demichelis, Frank Lampard, Bacary Sagna and Alvaro Negredo for the game.